I was trying to tell the person that, while it is true that mistakes will happen, it is not “okay” to make them…and expect that to lead to success. 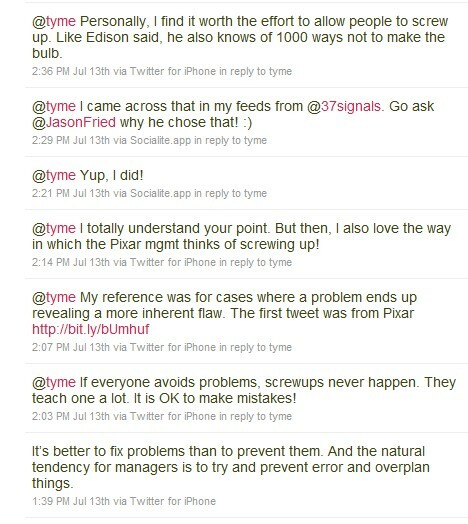 The person linked to a Pixar video where a quote about making mistakes was taken out of context. If you look at the video, it is clearly stated in the video that Pixar removes people from the team who continually make mistakes. When the person said Jason Fried linked to the video, I realized I could talk all day long and the person would never understand making mistakes and failing is not okay. Jason talked about this extensively so it really makes no sense to me why this person would think the video is about it being okay to make mistakes. Yes I do…it’s always the same reason: they want justification for their failures. As I said, mistakes will happen and I think people should learn from their mistakes. That does not mean that it is “okay” to make mistakes when there are options not to. If a situation is avoidable, avoid it. The people who succeed are the ones that are not trying to correct their mistakes. Instead, they focus on creating more successes. Successes are learning experiences as well. When something doesn’t work out right, see if you can improve it. That is more efficient than cleaning up the mess made from the mistake while trying to grab on to success. Being successful in business means being a leader in that particular field. Being a leader means that people follow you as customers, clients, readers, fans, etc. If you make mistakes, the people following you will be inconvenienced. Does that sound like good business? People who truly want to be successful are trying not to make mistakes. Let’s be real a minute. Between you and me. Want to know why people want to hold on to the idea it is okay to make mistakes? It gives them the okay to slack. It is an excuse to not be the best they can be. Most likely because they are already making mistakes, leading to failure, and they want that to be okay. It took Edison 1000 attempts to make the electric light bulb. The person who tweeted me said, “Personally, I find it worth the effort to allow people to screw up. Like Edison said, “He also knows of 1000 ways not to make the bulb”. Putting this in a business scenario, is it okay for a business owner to mess up 1000 times trying to do one thing? The more a company scales, the more costly it is to fix a mistake. When no one knows about a company, they can make a million mistakes and no one knows it. That gives the appearance that it is okay to make a mistake. If your car breaks down, and you take the car to the dealership or the repair shop for repairs. When you get your car back, and you have the same problem – do you say, “Oh, that’s okay! Everyone makes mistakes!” Or do you wish they fixed the problem correctly in the first place? If your spouse cheats on you, and you are kind enough to forgive him or her, and your spouse cheats again, is it okay because your spouse made the mistake of making the same mistake twice? Note that you can’t make the same mistake twice. The second time isn’t a mistake. The bank did not post your deposit, causing checks on your account to bounce. The bank is fixing the problem, but you have to contact the people you wrote the checks to, tell them to send it through again, make sure the bank reimburses you for the fees they charged…was that mistake really okay? Your boss gives you a date when a project is due. Three weeks before the project is due, your boss says the project is really due in two days and it better be done. Would you be okay with that mistake? Truth: most people wish mistakes didn’t happen in the first place. Truth: When people are paying for something, the expectation is there will be less mistakes or inconveniences. If people do not generally like being inconvenienced by mistakes, how can someone logically say it is okay to screw up in business situations? Repetitively? Perhaps, if you focused on successes, you wouldn’t make mistakes. Keep thinking it is okay to make mistakes, you will make them. Over and over again. And when you do not have the success you want…you will know why.